Grilled chicken is a family favorite for just about any occasion: graduation, Father's day, even a typical summer evening out on the deck as you host your family's BBQ night. Kids are picky eaters and might not want to try anything else with their chicken besides barbecue sauce or ketchup, so this Blueberry Ginger Reduction Sauce is a great recipe to keep on hand for the adults. 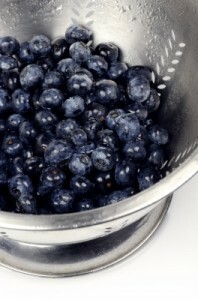 It's sweet, spiced (yet not spicy), and packed with superfood antioxidants from the blueberries and garlic. In a large heavy saucepan, add all ingredients, stirring to combine. Bring to a boil and immediately turn heat to low. Simmer, uncovered, slowly for 20 to 25 minutes or until sauce thickens and reduces. Stir several times during cooking time. Serve immediately over chicken when reduced to desired consistency and taste.